Did you know that until you start actually searching it is amazing at how many orange threads, ribbons and embellishments are out there for our enjoyment. Just a recent as a couple of years ago, oranges were very sparse and far between. 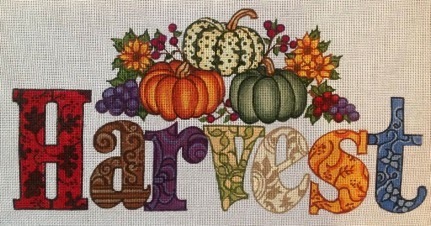 The new Online Mystery Class - HARVEST - will be showcasing some of the yummy threads, ribbons and embellishments. Look at the wonderful pumpkin! There are at least 3 shades of orange going on there. And those flowers! Whatever will we do with those? Forget the 'e'! My creative juices are really flowing on this one. Ribbons, beads, threads - - - I can't wait to tackle that one. Enrollment is going on right now so don't miss out. Come join us for the fun, fun, fun. The piece is being stitched on both 18ct and 14ct so we plan to have lots of stitch-as-we-go photos to share with those taking the class. My partner, Teresa, (my daughter and a beautiful stitcher/designer in her own right) is stitching the 14ct for your pleasure. 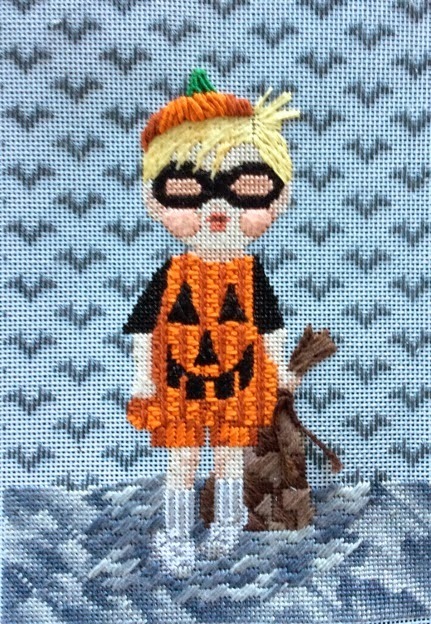 Most of these will not be included in the commercial stitch guide. So the online class offers much more personal one-on-one attention to those who seek it as well as more in-depth visuals. Detailed diagrams and illustrations abound. Registration is open until mid-March. First class begins mid-April. To enroll simply send an email to duodesignsinc@yahoo.com and say I want in. Then you decide if you want 18ct or 14ct painted canvas and order through your LNS. A materials list will be provided once it is completed so you will have time to search your stash, order from your LNS or take advantage of thread kits that will be provided by some select shops. Classes will be posted monthly for 6 months. Class fees are $25 per month. A PayPal invoice will be sent to participants a few days prior to the next lesson's posting. 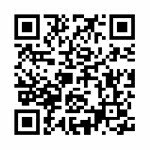 Some have requested a lump sum payment which is acceptable and can be processed through a PayPal invoice or personal check. Email me right now before you forget it and join in the fun! We'd love to have you join us! Remember to stay warm and stitch with a smile! Enough snow, I'm gonna think Autumn! One of the positives about snow is that it sets up a wonderful ambience for stitching in front of the fireplace (and boy do I have a fireplace)! While the current online Mystery Class - Mod Ornaments is now half over, I am focusing some attention to the next one in queue - HARVEST! 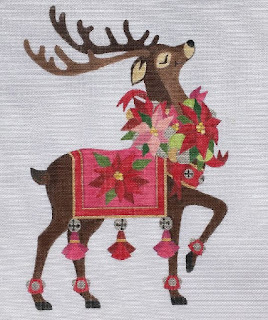 This beautiful canvas #R888 is hand painted by Robbyn's Nest and may be ordered through your local needlepoint shop. The canvas may be ordered on 18ct or 13ct canvas. The design area is 10"x15" and requires 14" x 19" stretcher bars. This design gives us the beautiful fall colors and feelings without being holiday related. So, it can be utilized and displayed much longer. During our introduction lesson, we will discuss various ways to consider having it finished for display. This Online Mystery Class is made up of 6 monthly lessons - each one is $25.00 and provided in pdf format so you get the lesson instantly! You are billed once a month through PayPal. Or, as many prefer, you may make a lump sum payment of $150. 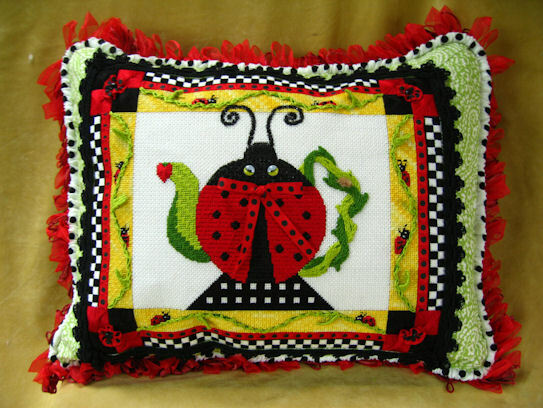 Check with your local needlepoint shop as many have hosted a stitch-in at their shop for previous Online Mystery Classes. To register all you need to do is send an email to: duodesignsinc@yahoo.com and state that you would like to participate and provide the email that is to be used for communicating. Further instructions will follow. You are responsible for ordering your canvas from your LNS and once the materials list has been completed and distributed you can choose to use stash, purchase or take advantage of shops that have notified me that they are able to provide a thread kit (I will be passing this information along to those that are registered once I get it compiled)! So all that is left to do is register by March 15, 2015, get your canvas ordered and wait for the first lesson in mid-April! 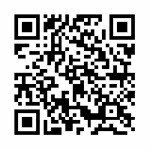 New Stitch Guides added to Website. Stitch guides are listed by designer. While visiting check out some of the other guides that are available. Guides are priced according to category of those available through the designer that have wide commercial exposure through your LNS and those that are custom designs written for more limited use. Check back often as my fingers continue to work, work, work! 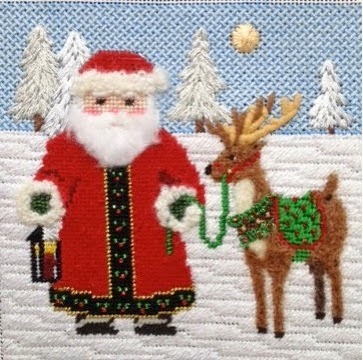 Remember to stitch with a smile even if it is snowing like it is here! Thinking of warm weather here in cold Kentucky. As my mind wanders from this coldness I am thinking of my upcoming class in Sarasota, Florida at the wonderful shop - A Good Yarn! 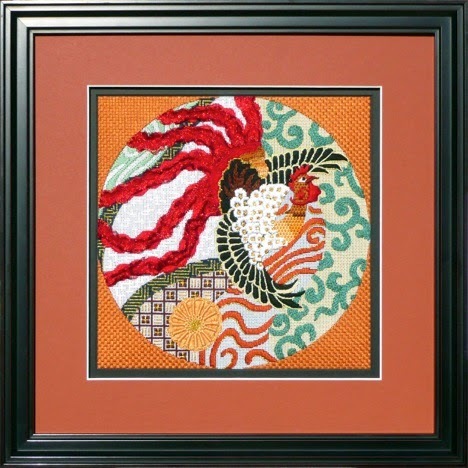 www.agoodyarnsarasota.com March 20, 21, and 22 A Good Yarn will be hosting the class for a wonderful Leigh Design from the Imari Series - Flaming Fowl. 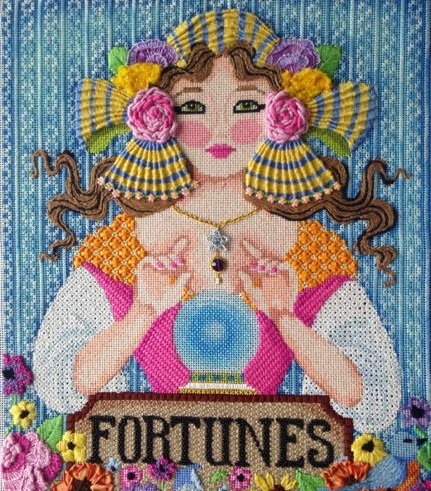 This wonderful piece has techniques, threads and embellishments galore! Project is hand painted on 18 ct canvas and requires 14” x 14” stretcher bars. Experience the versatility of Wonder Ribbon, Swarvoski crystals, and many scrumptious threads including Rainbow Gallery Sparkle Braid and Patina, DMC, Pepper Pot Silk, Planet Earth, Kreinik Braid, Vineyard Silks, Gloriana, Planet Earth and Caron Impressions. Dimension is created with fantastic threads and stitches that add ‘flames’ to the Flaming Fowl. Play with Wonder Ribbon to give movement and dimension to the tail and add sparkle and fire with Swarvoski crystals. OrNue’ technique band, raised bands and woven flower add to the delight of our journey in creating this piece. The finished model is on display at the shop so be sure to stop by and see it in person so you can appreciate the dimension created in this fantastic tail and see the real bling all those crystals flash before your eyes. It truly must be seen to appreciate its beauty. We have the next Mystery Online Class ready for registration! 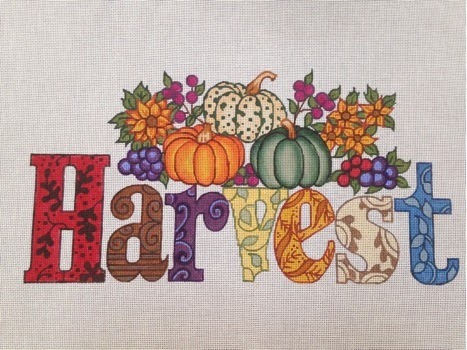 Harvest is a beautiful design by Robbyn Nease of Robbyn's Nest. This beautiful canvas is available on 18 ct. or 13 ct. canvas. The design area is 10" x 15" painted on a cut canvas of 14" x 19" size. 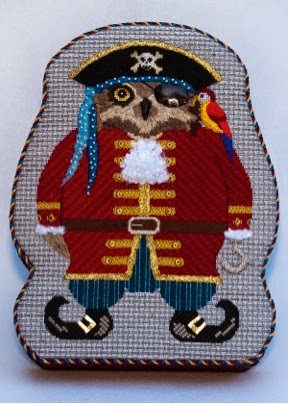 Participants are responsible for obtaining their canvas through their local needlepoint shop. Also, individuals will be provided with a list of suggested materials to obtain from their LNS or stash. A list of shops that will have thread kits available for purchase will be provided once it is developed. Should individuals have difficulty obtaining their canvas or supplies, please contact duodesignsinc@yahoo.com for assistance. There will be 6 detailed lessons accompanied with great illustrations and instructions. Each month a PayPal invoice will be sent to each individual participant. Those wishing to do so may pay for all 6 lessons in a lump sum payment of $150. This can be done through PayPal invoicing or through a personal check by contacting duodesignsinc@yahoo.com and communicating your preference. The first class will be emailed in mid-April 2015. Each subsequent lesson will be mailed monthly thereafter to those who have kept their payments current. Registration is now open through March 15, 2015. To register simply send an email to duodesignsinc@yahoo.com and let me know that you want to participate in the class. You must provide your email address where you wish to receive your PayPal invoice which is mailed monthly in the amount of $25. The January/February 2015 issue of Needlepoint Now has a wonderful ad displayed on page 26 listing these details of the class. Come join us for more fun and interesting techniques and approaches to various stitches. Based on previous classes it is suggested that you order your canvas right away. Robbyn is already busy filling orders so don't delay! Who knows what each mystery will reveal! We can promise that we will have fun!